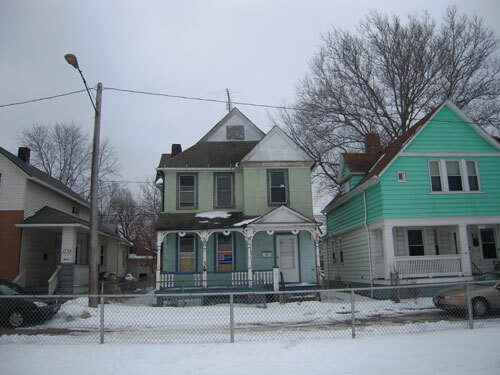 The Cuyahoga County Land Bank was created to deal with the mass of abandoned properties in this area. 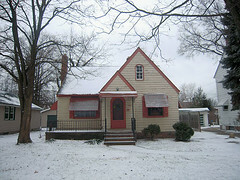 Unlike the Cleveland Land Bank, the county landbank deals both with vacant land and land with residences still present. Their listsings make for some interesting reading. The following properties are some of my recent favorites. I will be encouraging them to try to find new owners for them instead of demolishing the structures. I haven't been inside any of them, so I can't speak to their internal condition. 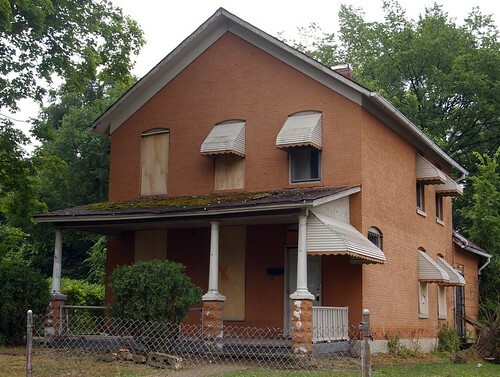 This house appears to have been built in the 1870s. 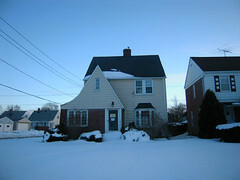 While the style is fairly common in the neighborhood, it is seen much less frequently in brick. The proportions are good - the house is proportionally a bit wider than what we might usually see, making it feel more comfortable and less cramped. This might suggest a slightly earlier date, or it might just be a particular builder's aesthetic choice. 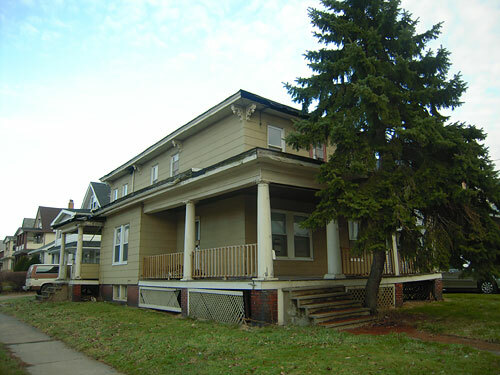 This house, at 4166 East 100th Street, provides some idea what the house might look like without the front porch, which was added later. A close investigation might reveal if such ornate decoration was present around the windows of the house on Gaylord. I suspect that this was not the case - that it was a simpler design. To this end, it excels. A reader pointed out this Italianate style house to me a while ago. I haven't been able to learn much about it. The county auditor lists the date of construction as 1850 - which is possible - but, lacking any evidence to support that, I'd guess closer to 1860-1880. It's still an interesting historical house. 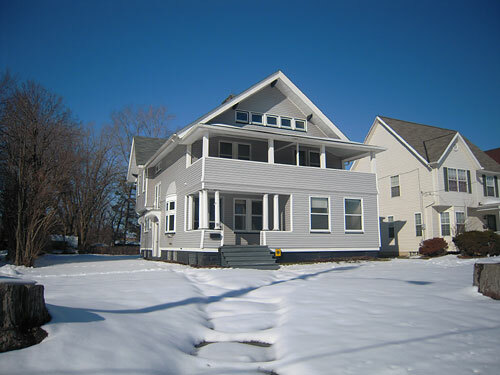 This house, built c. 1885, caught my eye. It's a combination of the detail in the porch and the overall proportions. It's the same way I feel about this house, at 2208 East 73rd Street. This house appears to have some great detail. There are hints of it on the left side. There's something that seems right about the front porch - I'd be curious to see what it, and the rest of the front of the house onced looked like. There's something interesting here - the question is just as to what it is. These two houses, 960 Woodview Road, Cleveland Heights, Ohio and 14520 Tokay Avenue, Maple Heights, Ohio, both share some Tudor elements and visual appeal. 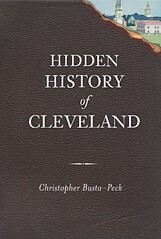 A few others that caught my attention were 12805 Signet Avenue, Cleveland, Ohio, 3729 West 39th Street, Cleveland, Ohio, 3450 West 97th Street, Cleveland, Ohio and 1851 Burnette Avenue, East Cleveland, Ohio. The houses are out there. We can't complain about trouble locating the owners or issues with titles. Right now, it's a matter of us moving forward and doing something.